Itâs not often that a home is characterized as a work of art, where attention to detail is so apparent and every space thoughtfully crafted. 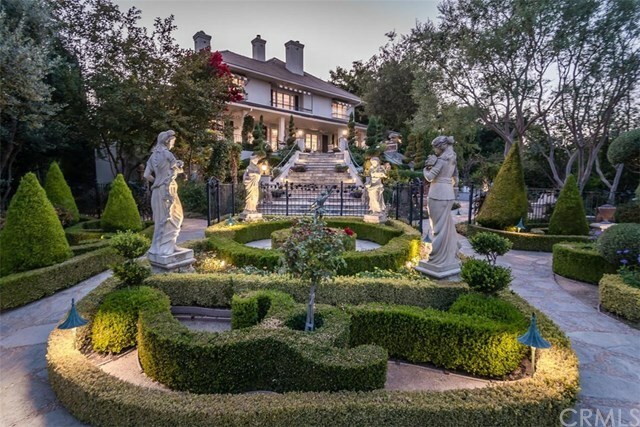 This amazing estate sits on 33Â± acres, in the heart of Wine Country. From the moment you enter, you are truly surrounded by spectacular manicured gardens, enchanting walkways, gatehouse, game area, mature fruit trees, grotto waterfall, Japanese Meditation house, Studio, Tree House and a Monet-inspired, Koi-filled lagoon. The 6,584Â± sq. ft. Hampton-style main home offers 4 bedrooms and 6 baths, including a separate 1 bedroom Guest Suite with a balcony. There are 4 wood burning fireplaces located in the Living Room, Sitting Room, Master Suite and the Al Fresco Dining area, Exotic stone countertops throughout, a Bang & Olufsen sound system, Baccarat chandeliers, state of the art stainless steel appliances and a Wine Cave. Enjoy breathtaking views while taking a dip in the solar heated infinity pool and spa. Additional amenities include a Managerâs house with 4 bedrooms and 3 baths, 2 barns and a 700 tree pomegranate orchard, 3 wells and acres of land that can be planted, if desired. The beauty and magnificent setting of this estate will create cherished memories for generations.